The Loire Valley’s Vouvray AC is one of the hallmark appellations for the Chenin Blanc grape. This is the most important white wine appellation in Touraine and while it is acceptable to include some Arbois in your whites here, for the most part it’s all Chenin Blanc, all the time. Wine has been produced in this region since the Middle Ages and today’s vintners owe a lot to past eras of monks and monasteries – as well as to the Dutch – all of whom helped develop viniculture here significantly. The wine cellars of the region are carved out of tuffeau, a sedimentary rock that has formed over time to be a chalky limestone perfect for building blocks and creating storage cellars for wine and mushrooms. Some of the most beautiful public buildings in the area are built from the excavated limestone blocks. The AC’s porous tuffeau soils are blended with clay and gravel and this makes them excellent for grape growing; some of the best expressions of Chenin Blanc can come from here, although there is a risk of vintage variation in this northern climate. Vouvray is where the maritime climate meets the continental in the Loire Valley and the harvest here is usually amongst the last in France; it can last well into November and this is often exacerbated by the fact that Chenin Blanc buds early but also ripens extremely late. In cooler years, high acidity can overwhelm the fruit and cause the wines to fail to exhibit unique Chenin Blanc flavours of stone fruit, honey and straw. Climate change, however, is making vintage variation less of a risk. This grape is capable of producing all types of wines from dry to lusciously sweet. In this case, the wine is 100% Chenin Blanc and of the Saget la Perriere Estate which has been family-owned for 8 generations. It’s clear and bright, pale gold with legs. The nose is youthful and clean with medium intense aromas of wet rocks, honey, white blossoms and stone fruit. The palate is medium sweet with high acidity, medium alcohol, medium plus body and medium plus intense flavours of light pink grapefruit, ripe pear, apricots, honeysuckle blossom, almond and strong minerality. The finish is medium plus. An undeniable deal at only $16.99, it is a WSET ‘very good’ wine – the 2009 was rated 91 and the 2010 earned 92 on Wine Spectator. Drink this with spicy Asian/Thai food. I enjoyed it with veggie stirfry with garlic and soy sauce. This entry was posted in Chenin Blanc, France, WHITE. Bookmark the permalink. In fact, I think I got this at Trader Joe’s in Bellingham – it was one of their more expensive ones…Good luck! 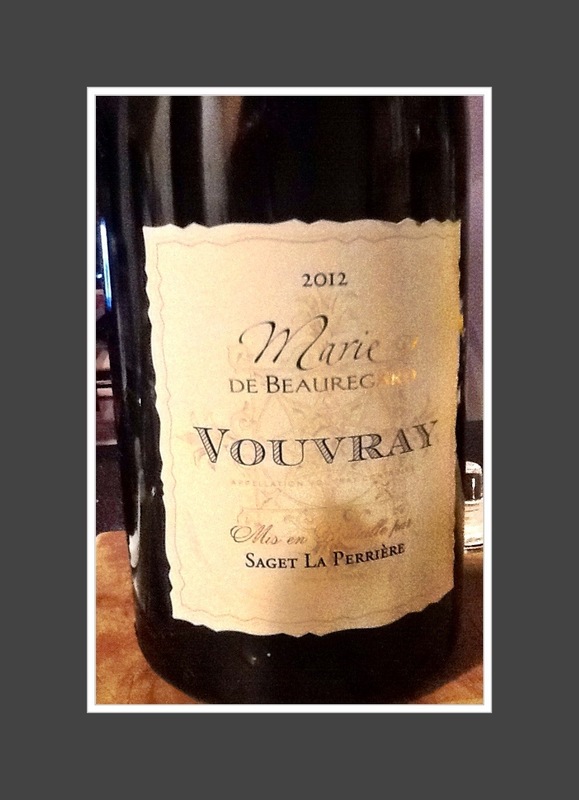 Why, oh why can’t we buy Vouvray when we buy our groceries in Canada? No kidding, eh? Working on that!